Mythic Heroes have swept over Sapphire for a couple of months, gaining huge popularity with players thanks to their incredible skills and great growth potential. Meanwhile, Legendary Heroes like Alecta, Theresa, and Aphrodite lost their once dominant poisition. But now, they will have their chance to reclaim the throne! 1. 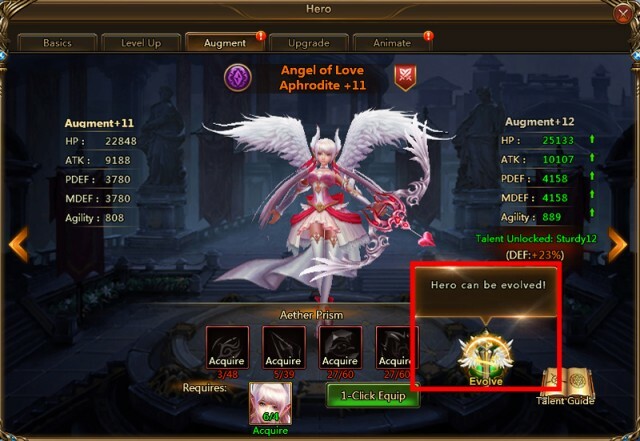 Requirement: Heroes at Augment +11 and above can be Evolved. 3. Access: Open Hero Augment panel, and click on the “Evolve” button on the right of the prisms. (1) Legendary Heroes will evolve into Mythic Heroes and gain 1 new skill and their original skills will be enhanced as well. (2) Mythic Heroes will remain Mythic after evolving, but their skills will be enhanced. 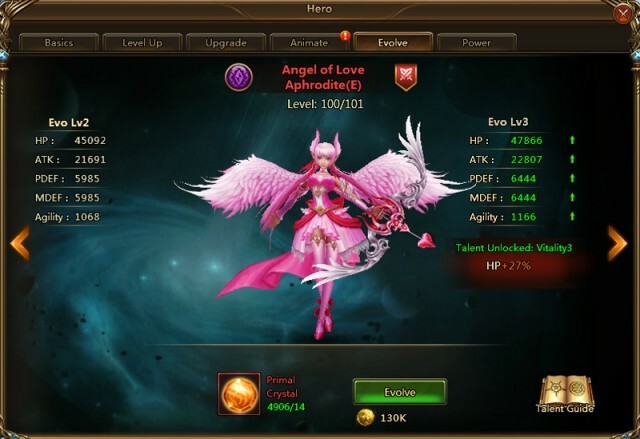 (3) Hero’s initial Evo Level after evolution will be equal to their Augment level minus 11. (4) For each Evo level upgrade, a Hero gains bonus to basic attributes and a special attribute. (5) The first Evolution consumes Hero Cores. To level upgrade in Evolution consumes Primal Crystals and Gold. (6) After evolution, the Evolve function will replace the Augment function for that Hero. After evolution, Legendary Heroes not only gain greatly enhanced kill effects, but also keep the same affinities! When Heroes are evolved, another mysterious Hero Progression system, Power, will be unlocked! As you can see, Power appears as a line of linked nodes. 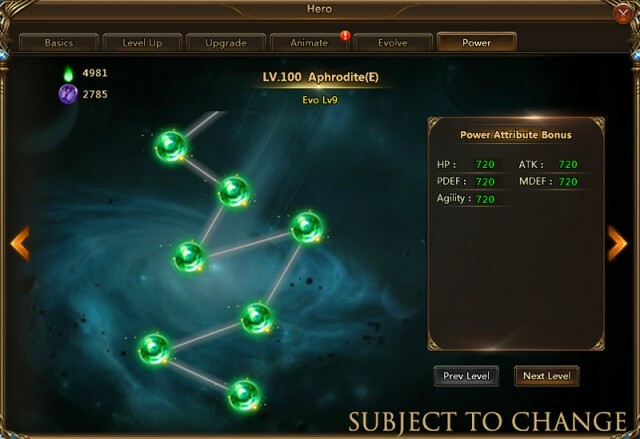 Activating each node will grant attribute bonus, including value and rate bonuses to the hero. The progress of Power is subject to the level of Hero Evolution. Players need to activate the Power Nodes one by one. The Power system can be divided into several types to serve different types of Heroes. Power upgrades consume Power Essences. Power Essences and Primal Crystals can be obtained from cross-server game modes. Stay tuned for more news! The Mythic frenzy is continuing on Sapphire! Hopefully some of your favorite Legendary Heroes can now become Mythic and reclaim their glory on your squads! If not, don’t worry, more Heros will be added to the Evolve system soon! 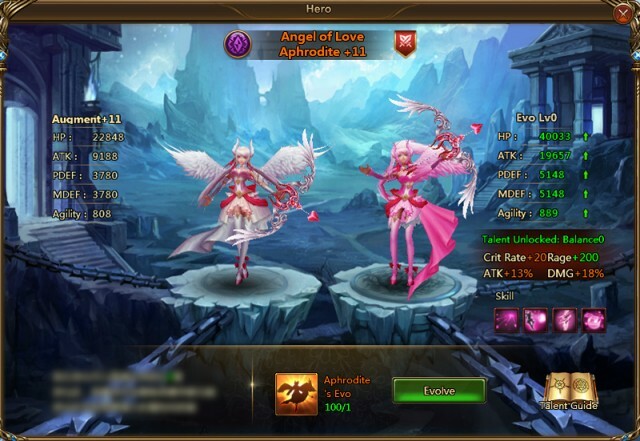 Play League of Angels II now and experience the best Web Game of 2016!